Making good use of the hours and minutes of the day requires planning, prioritizing, and sticking to a schedule. These skills don't come easily to children with attention deficit disorder (ADD). How can you help your students do a better job of estimating how long it takes to complete a task or to get somewhere? Here are some helpful strategies for parents to do with their children. Make a game out of predicting, timing, and checking students' estimates of the time needed for various activities. How long does it take to perform a chore? To walk to school? 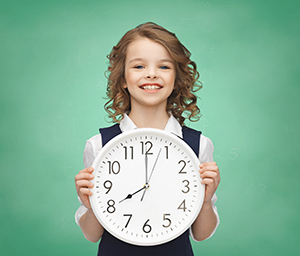 By helping your student become aware of the time required to perform a task, you are helping them see where their time goes. Smaller children can see this as blocks fitting into a box. Digital clocks are easier to read, but an old-fashioned clock with hands gives students a better sense of how swiftly time passes. Make sure students begin tasks promptly. Children with ADD often use delaying tactics—like sharpening a pencil—to put off doing tasks they find boring. Once you get them started – and focused – they can stay on task, especially if it is something they enjoy. I would recommend using fun reminders instead of nagging. A little humor goes a long way! Long sessions of homework and reading practice can be torture of a student with ADD. Break up long focus sessions with opportunities to do something different, if for only a few minutes. These should be something stimulating like listening to music, walking the dog, or some form of creative outlet. More work on a different subject might be too much. This is especially true of the marathon last minute Science Fair Project or book report. The stress associated with completing the task will negate anything they would learn. Remember, students with ADD think in their own unique way. Try to structure their working spaces and schedules to make success not just easy, but attainable. Your love and creative support now with pay off for many years to come. Have a Neat and productive day!